(Nanowerk News) Antibodies are proteins that work inside our bodies to protect us from diseases by binding and detecting foreign target molecules known as antigens. However, an antibody isolated in a test tube cannot tell us about the existence of and/or binding to its target without the use of specific and expensive instrumentation to detect its existence. 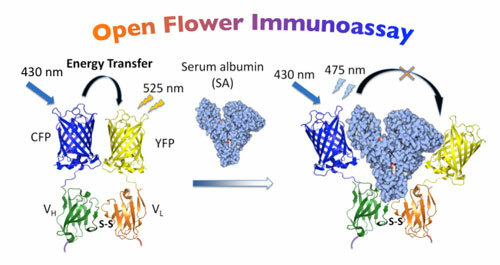 Now, Hiroshi Ueda and colleagues at Tokyo Institute of Technology and The University of Tokyo have successfully constructed a fluorescent biosensor for serum albumin by carefully connecting the two color variants of a green fluorescent protein to the antigen binding fragment of an antibody ("Open flower immunoassay: a general method to make fluorescent protein-based immunosensor probes"). They used two fluorescent proteins (FPs) that emit cyan and yellow colors to detect the distance between them. When the distance was large, cyan fluorescence was observed by irradiating with blue light, and conversely, when the distance was small, yellow fluorescence was observed due to so called energy transfer mechanism. When they engineered a probe by genetically connecting each FP to one of two chains of an antibody fragment, a remarkable fluorescent color change was observed upon adding bovine and human serum albumins, the antigens for this antibody. The probe constructed by the researchers was made entirely of proteins, and successfully detected clinically relevant range of serum albumin by just mixing with a test sample and measuring its fluorescence. Since it is antibody-based, the method which they call "Open Flower immunoassay" is expected to have many applications ranging from basic biological research tools to clinical diagnostics.